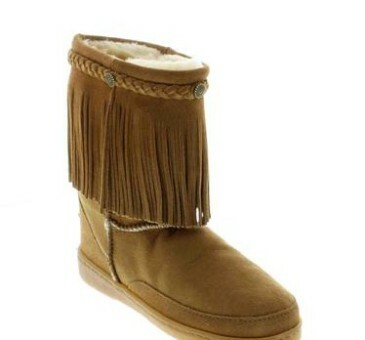 Home Page › Posts tagged "Minnetonka"
Check Out Our New Minnetonka Fringe Boots for Kids! Fringe boots are definitely the latest hot fashion trend for fall, and The Sheepherder is proud to announce a new selection of sheepskin Minnetonka fringe boots for kids and adults, available both in our shop and online. Made from authentic sheepskin, the adorable Minnetonka fringe boots provide the luxurious comfort of a sheepskin boot, but with a fashionable fringe detail perfect for any western-inspired outfit this fall. The Minnetonka fringe boots for children and adults are available in a range of colors, including tan, black and gray, and also feature a leather braid with metal studs along the top of the boot for a little extra flair.